Smirnoff remains the world’s best-selling vodka, having posted volume sales of 25.5m 9-litre cases in 2016, according to Drinks International’s Millionaires’ Club 2017. The Diageo brand slid 1% on 2015 but has vastly superior volumes to Pernod Ricard’s Absolut, which flat-lined at 11m cases. 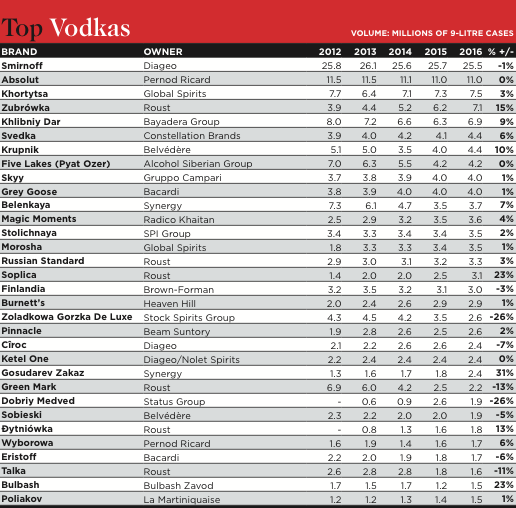 Khortytsa from Global Spirits came third in the ranking with growth of 3% to 7.5m cases, keeping it ahead of Roust’s Zubrowka which grew 15% last year to 7.1m cases. Bayadera Group’s Khhilbniy Dar, piled on 9% growth making it the fifth-ranked brand in the list with 6.9m cases. The only super premium vodka in the top ten best-selling vodkas is Grey Goose. With sales of 4m cases, growing at 1% in 2016.